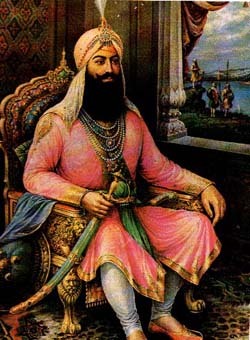 Sardar Jassa Singh, son of Giani Bhagwan Singh, was born in 1723. His ancestors were great Gursikhs devoted to Gurbani and sewa. They lived in the village of Ichogil, near Lahore. His grandfather took Amrit during the lifetime of Guru Gobind Singh, and joined him in many battles. Later, he joined the forces of Banda Singh Bahadur. Sardar Jassa Singh was the oldest of five brothers. Like his grandfather, he lived his life as a brave soldier of the Khalsa Panth. His father trained him in reading Gurbani. He memorized Nitnem hymns and took Amrit when he was still young. In 1733, Zakaria Khan, the Governor of Punjab, having failed to subdue the Sikhs, decided to befriend them. He needed their help to protect himself from the Afghan invader, Nadir Shah. He offered the Sikhs an estate and a royal robe. The Sikhs accepted it. Sardar Jassa Singh and his father joined the Sikhs to fight against Nadir Shah. The father died in battle. Zakaria Khan gave five villages to his sons in reward for his bravery. Village Vallah was awarded to Sardar Jassa Singh, where he gained the administrative experience required to become a leader, Jathedar, of the Sikhs. During this period of peace with the government, the Sikh Jathedars had become quite strong and built their fort, Ram Rauni, in Amritsar. Zakaria died in 1745 and Mir Manu became the Governor. He was worried about the increasing power of the Sikhs. To finish the Sikhs, he let loose unspeakable terror against them. A mention of the sacrifices of these Sikhs is made in the Ardas. Mir Manu also ordered Adina Beg, Faujdar (Administrator) of the Jallandar region, to kill the Sikhs. Adina Beg was a very smart politician and wanted the Sikhs to remain strong to keep Manu involved with them. In order to develop good relations with the Sikhs, he sent secret messages to them. But, as the Sikhs were in hiding in different places, they could not get together for a collective Panthic decision. Thus, the Individual Jathedars responded differently as it suited their plans. Jassa Singh agreed to cooperate with the Faujdar and was made a Commander. This position helped him develop good relations with Dewan Kaura Mal at Lahore and assign important posts to the Sikhs in the Jallandar division. This favorable situation for Jassa Singh did not last long. The Governor of Lahore ordered an army attack on Ram Rauni to kill the Sikhs staying in that fort. For this purpose, Adina Beg was required to send his army as well. Jassa Singh, being the commander of the Jallandar forces, had to join the army to kill the Sikhs in the fort. This was very painful for him. After about four months of siege, Sikhs ran short of food and supplies in the fort. They were on the verge of leaving the fort to fight their way out with the certain loss of many Sikh lives. Jassa Singh could not bear the thought of the impending fall of the fort and murder of the Sikhs. He contacted the Sikhs inside the fort and joined them. It was a great morale booster for the Sikhs and a big jolt to the army surrounding the fort. Furthermore, Jassa Singh used the good offices of Dewan Kaura Mal and had the siege lifted. Every Sikh in the Dal Khalsa appreciated his courage and liked him for his timely help. The fort was strengthened and named Ramgarh; Jassa Singh, having been designated the Jathedar of the fort, became popular as Ramgarhia. Manu intensified his violence and oppression against the Sikhs. There were only 900 Sikhs when he surrounded the Ramgarh fort again. The Sikhs fought their way out bravely through thousands of army soldiers. The army demolished the fort. The hunt for and torture of the Sikhs continued until Manu died in 1753. Manu’s death left Punjab without any effective Governor. It was again an opportune period for the Sikhs to organize themselves and gain strength. Jassa Singh rebuilt the fort and took possession of some areas around Amritsar. The Sikhs took upon themselves the task of protecting the people in the villages from the invaders. The money they obtained from the people was called Rakhi (protection charges). The new Governor, Taimur, son of Ahmed Shah Abdali, despised the Sikhs. In 1757, he again forced the Sikhs to vacate the fort and move to their hiding places. The fort was demolished, Harimandar was blown up, and Amrit Sarovar was filled with debris. The Governor decided to replace Adina Beg. Beg asked the Sikhs for help and they both got a chance to weaken their common enemy. Adina Beg won the battle and became the Governor of Punjab. Sikhs rebuilt their fort Ramgarh and repaired the Harimandar. Beg was well acquainted with the strength of the Sikhs and he feared they would oust him if he allowed them to grow stronger, so he lead a strong army to demolish the fort. After fighting valiantly, the Sikhs decided to leave the fort. Beg died in 1758. The greatest blow to the Sikhs was the Wada Ghalughara or Great Massacre, in February of 1762. The Sikhs were moving towards dry areas to safety, when Ahmed, the Afghan invader, attacked them with vengeance and without warning. The Sikh deaths are estimated between 40,000 and 50,000. Jassa Singh himself suffered about two dozen wounds in this battle. This heavy blow, instead of demoralizing and incapacitating the Sikhs, committed them to greater service of the Panth. They gathered at Amritsar and defeated Ahmed on 17 October of that year. In the dark, he left the battlefield and escaped to Afghanistan. The Sikhs were again in a position to take control of many areas of the state. Each Misl, a section of the Sikhs, occupied a different region. There were eleven such Misls of the Sikhs (excluding the one which ruled Patiala, the region to the east of the Satlej River). Collectively, the called themselves the Sarbat Khalsa. When, in 1764, Ahmed again came to crush the Sikhs, they left for their safe hideouts and let him move forward. On his return from Delhi, when he crossed the Satlej, Sikhs attacked him swiftly and ferociously. They took away his looted wealth and escaped. Ahmed received the same treatment when he invaded again in 1767. Even though he defeated the Marhattas and looted Delhi many times, he could not subdue the Sikhs, who continued to stand in his way. Because of the vengeful behavior of Ahmed and the honorable character of the Sikhs, the Muslims of Lahore bluntly told Ahmed that they would not cooperate with him unless he offered the Governorship of Punjab to the Sikhs. But the Sikhs declined the offer of governorship, because they were already the de facto rulers of Punjab and people regarded them as their saviors. Sardar Jassa Singh Ramgarhia occupied the area to the north of Amritsar between the Ravi and the Beas rivers. He also added the Jallandar region and Kangra hill areas to his estate. He had his capital in Sri Hargobindpur, a town founded by the sixth Guru. The large size of Jassa Singh’s territory aroused the jealousy of the other Sikh Misls. They did not want him to become too powerful and the ruler of a big region. Although Jai Singh and Jassa Singh were close friends, strong differences arose between them because of mutual jealousy. Bhangi Misl sardars also developed differences with Jai Singh. As a result, a big battle was fought between Jai Singh, Charaht Singh, and Sardar Ahluwalia on one side and Bhangis, Ramgarhias and their associates on the other side. The Bhangi side lost the battle. Later, the Ahluwalia sardar, one day while hunting, happened to enter Ramgarhia territory where Jassa Singh’s brother arrested him. Jassa Singh apologized for the misbehavior of his brother, and honorably returned Ahluwalia with gifts. However, their old differences increased further. Other sardars also took a grim view of this Ramgarhia act. Due to mutual jealousies, fights continued among the Sikh Sardars. In 1776, the Bhangis changed sides and joined Jai Singh to defeat Jassa Singh. His capital at Hargobindpur was taken over and he was followed from village to village, and finally forced to vacate all his territory. He had to cross the river Satlej and go to Amar Singh, the ruler of Patiala. Amar Singh welcomed the Ramgarhia sardar in order to make use of his bravery, fighting skill, and ruling experience. He gave him the areas of Hansi and Hissar which Jassa Singh handed over to his son. He himself joined Amar Singh to take control of the villages on the west and north of Delhi, now forming parts of Haryana and Western U.P. The Sikhs disciplined and brought to justice all the Nawabs who were harassing their non-Muslim population. Jassa Singh Ramgarhia entered Delhi in 1783. Shah Alam II, the emperor, did not dare face the Sikhs, rather he extended them a warm welcome. Ramgarhia left Delhi after receiving gifts from him. Because of the differences arising out of the issue of dividing the Jammu state revenues, long time friends and neighbors Mahan Singh, Jathedar of Sukerchakia Misl and Jai Singh, Jathedar of the Kanahya Misl, became enemies. This resulted in a war which changed the course of Sikh history. Mahan Singh requested Jassa Singh to help him. In the battle, Jai Singh lost his son Gurbakhsh Singh while fighting with Ramgarhias. His widowed daughter-in-law, Sada Kaur, though very young, was a great statesperson. She saw the end of the Khalsa power through such mutual battles. She could foresee that to rule Punjab, Sikh Misls must give up their mutual jealousies and unite to form one big power. She was able to convince Mahan Singh to adopt the path of friendship. For this she offered the hand of her daughter, then only a child, to his son, Ranjeet Singh (later the Maharaja of the Punjab), who was then just a boy. The balance of power shifted in favor of this united Misl. Some other sardars also joined them. This made Ranjeet Singh the leader of the most powerful union of the Misls. When the Afghan invader, Shah Zaman, came in 1788, the Sikhs, however, were still divided. Ramgarhia and Bhangi Misls were not willing to help Ranjeet Singh to fight the invader, so the Afghans took over Lahore and looted it. As soon as the Afghans went back, Ranjeet Singh occupied Lahore in 1799 but the Ramgarhias and Bhangis did not accept him as the leader of all the Sikhs. They got the support of their friends and marched to Lahore to challenge Ranjeet Singh. The forces, who were 12 miles outside the city, were finalizing their plans to attack, when the Bhangi leader died. This discouraged Jassa Singh and he returned to his territory. Jassa Singh was eighty years old when he died in 1803. His son, Jodh Singh, developed good relations with Ranjeet Singh and they never fought again. The critical decision of Jassa Singh to join the Khalsa and save the Ram Rauni fort changed the course of not only his own life but that of Sikh history as well. He was honored as Ramgarhia. His name will always remain alive as the founder of the Great Ramgarhia Misl, who played a major role in the battles of the Khalsa Panth.